Ok so - starting over. The 50 States Binder did not have a project - I don't think any of the classmates cartridges do. So I just chose to put all the cuts for my state on a 12x12 sheet so you could see what they looked like. I'm a little disappointed that the capital and the state names did not have a shadow feature but I love the flag! I thought the birds were a little funky and the flower had too many layers but that's just me. Also the state shape was done at 4" look how tiny that thang is. 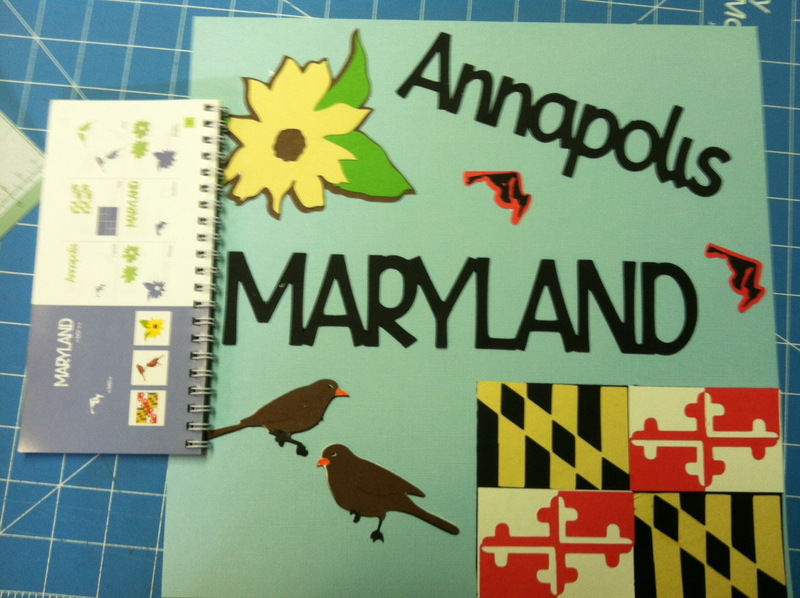 The one under Annapolis actually has a tiny star cut out of it to show you were the capital is. I just arranged them on a 12 by 12 so you could see how the cuts look. Don't forget there will be a post every day this week and you must leave a comment on each of them to qualify for the blog candy. Sorry blogger is being mean to you :( But great idea to show off this cart:) My girls are in school, so I'm ready when they start doing their state projects!! 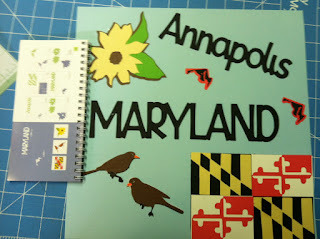 Love the Maryland page!!! I need to do countrys as well as states! This is so cool!!! I had been eyeing that cart but could never justify buying that cart! TFS! I think it's really cute Tangee! I agree that the state is REALLY small considering it was cut on 4". Wonder what it would have looked like if it was cut on 12"! LOL Great blog! Great job!! I don't know why some cuts come out soooo small even when you set the size at a larger number!! I have had that happen to me on a project and it is just soooooo frustrating!! you always make me laugh! !FB or your blog!Love it!Thanks for that! Boy, blogger has been a buger to everyone lately! 50 states is one of the first carts I got, thinking my grandkids will use it for school. They are in 3rd,4th and 5th grade and so far- no state projects!! Your state flag is amazing! The birds look like they should be on a wall clock, but they do look great! I guess the size of your state is proportional to states like Texas and California. Just remember, big things come in small packages! Lol! Love this! Sorry I posted but it didn't take! I've got this cart so I def. wanted to see what you were doing with it. Thanks for sharing. I don't have this cartridge! Thanks for the ideas!